One of the most apparent changes iOS 7 brought to iOS apart from the complete new look was new animations and transitions. These animations were present in most parts of iOS and users had to see them every time they went back to their home screen from any app or performed other actions. While many people liked this new addition others didn’t. There were even reports about people feeling motion sickness due to abundant animations and transitions in iOS 11 or later. It looks like Apple was aware of this issue as it has fixed it in the new iOS 7.0.3 update. The software update released later for iPhone, iPad and iPod touch allows users to turn off iOS animations by adding more capabilities to the Reduce Motion option found in Settings app. In iOS 11 by turning on reduce motion from settings app you can turn off the animations that are shown while switching between apps, going to the home screen, moving between folders and unlocking the device. The animations are replaced by a cross fade affect that seems to make iOS look even faster than before. All you have to do is launch the Settings app and then go to the ‘General‘ option. Next you have to go to the ‘Accessibility‘ menu. 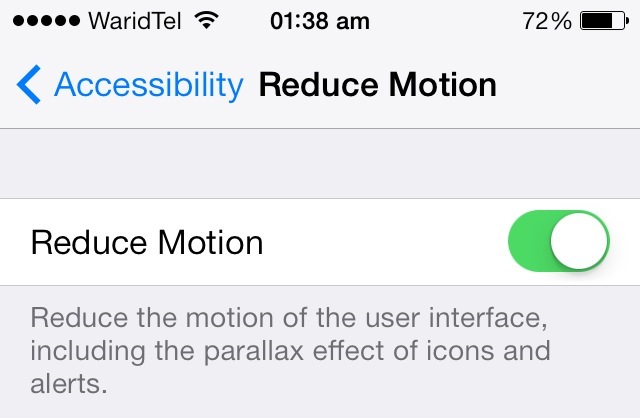 There you will find ‘Reduce Motion‘ option. Turn it on and exit settings.